102 b/w illus. 48 colour illus. 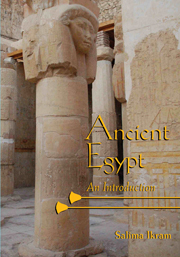 This book provides an introduction to one of the greatest civilization of all time – ancient Egypt. Beginning with a geographical overview that explains the development of Egyptian belief systems as well as its subsequent political development, it examines methodology, the history of the discipline of Egyptology, religion, social organization, urban and rural life, and death. It also includes a section on how people of all ranks lived. Lavishly illustrated, with many unusual photographs of rarely seen sites that are seldom illustrated, this volume is suitable for use in introductory-level courses on ancient Egypt. It offers a variety of student-friendly features, including a glossary, a bibliography, and a list of sources for those who wish to further their interest in ancient Egypt. 1. The black and the red: geography and environment; 2. Travellers, thieves, and scholars: the history of Egyptology and Egyptomania; 3. Recreating Ancient Egypt: sources and methodologies; 4. Shadows in the sand: Egypt's past; 5. Maintaining Egypt: religion; 6. Kings and commoners: Egyptian society and government; 7. Town and country life; 8. From sunrise to sunset: daily life of the Ancient Egyptians; 9. The living and the dead: mummies, tombs, and mortuary. "The great discoveries, the adventures of travelers, the mysteries of the pharaohs, the dance of the mummies, and the fragrances of life along the Nile – ancient Egypt comes to life in the pages of this excellent book!" "An ideal introduction to the myriad strands that make up the world of the ancient Egyptians--I recommend it highly and look forward to using it for my students."